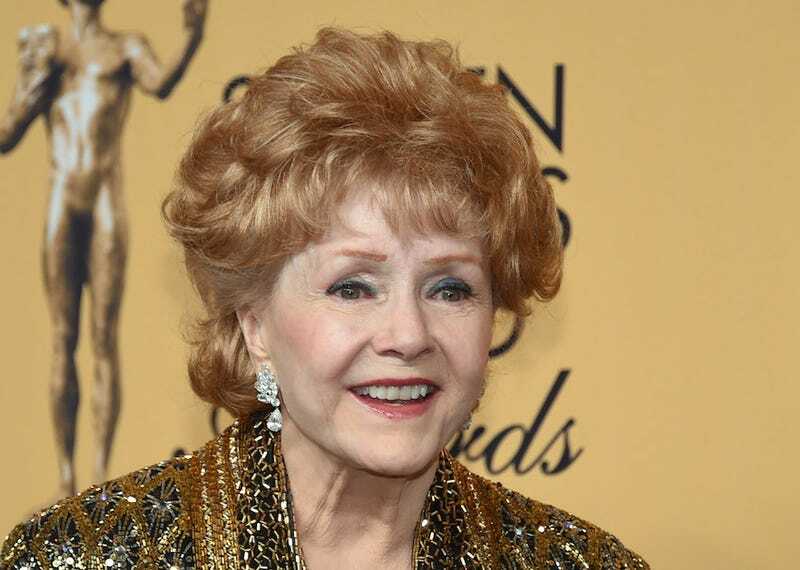 Debbie Reynolds, the iconic Hollywood actress and mother of Carrie Fisher, died on Wednesday after suffering a stroke earlier that day. She was 84. TMZ reports that Reynolds was rushed to the hospital after suffering what appeared to be a stroke at her son Todd’s house. Reynolds and her son were making funeral plans for her daughter, Carrie Fisher, who passed away Tuesday. Sources also say that Reynolds had suffered from a few strokes over the year and that her health was failing; the sudden and unexpected death of her daughter, Carrie, proved to be too much. Professionally, Reynolds was best known for her roles in Singin’ In the Rain and as the title character in The Unsinkable Molly Brown, a role that earned her an Oscar nomination. She also did a lot of voiceover work, including a star turn as the wry, kind voice of Charlotte the spider in the 1973 animated version of Charlotte’s Web, a delightful and sweetly sad film. Her personal life was a little more tumultuous; Reynolds was part of one of Hollywood’s most famous love triangles. Her first husband, Eddie Fisher, famously left her for Elizabeth Taylor in 1958, a scandal that rocked Hollywood at the time. Her relationship with her daughter, Carrie, was also immortalized,for better or for worse, in Postcards from the Edge, written by Fisher and later turned into a movie starring Meryl Streep and Shirley MacLaine. Here’s a charming clip of Reynolds in Singin’ In The Rain to remember her by. In her 198 autobiography, Reynolds wrote “‘Singin’ in the Rain’ and childbirth were the hardest things I ever had to do in my life.” Even if that’s true, look how well she did it. Reynolds is survived by her son Todd and her granddaughter, actress Billie Lourd.